Darbra, R.M. ; Demichela, M.; Mure, S.
Darbra, R.M. 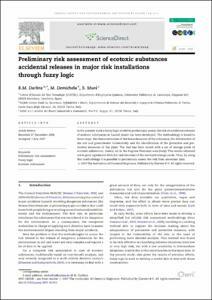 ; Demichela, M.; Mure, S. Preliminary risk assessment of ecotoxic substances accidental releases in major risk installations through fuzzy logic. "Process safety and environmental protection", Març 2008, vol. 86, núm. 2, p. 103-111.